By now you the hype has passed about analog television to DTV transition and Senior Citizens could still be left in the dark. You'll want to check that your aging parents have their DTV converter box for any sets that may not be frequently used. The DTV transition has happened. But maybe your folks have a second television... or the family vacation house is still analog. By ensuring that things will be fine with their TV viewing, you continue to establish that you are on the same team... making conversations about other more difficult topics that much easier. So what's up with this DTV Transition? 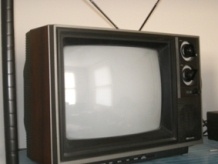 If your parents' television has a rabbit ear antenna or a roof antenna, it's an Analog TV and they will need a converter box to continue to get a signal. People with a hook up from one of the satellite TV or "dish" TV companies will be OK. A little trickier with cable. Some cable companies are still sending analog signals until February. If your parent's cable plugs directly into the back of their TV, they may still need a converter box to translate the digital signals that will be coming. Along with the converter box, you may very well have to update their antenna in order to properly receive the digital signals. Fortunately, there is great information to help you sort this out at AntennaWeb.org. The television stations in my area are being very good about the public service announcements that let us know that the conversion to Digital Television is coming. Recently, I even saw one of the required half-hour broadcasts, mandated by the FCC, to explain everything. But in that limited time, they could only scratch the surface. So the DTV Transition and Senior Citizens may still be far apart. Much of the detailed information is online. Many senior citizens are not online. Much of the information is technical. My mother still needs to use a cheat sheet to program her VCR. It's unbelievable that for the DTV transition that is required for the entire nation, some rural areas will still be left out and will receive no signal at all. Despite the advantages of digital signals, they do not bend like analog signals, and cannot bend around obstructions such as mountains to reach some rural areas. If your parents live in a remote area, call their local TV station to make sure they will be receiving a TV signal. Once you receive the converter box, you will probably need to assist your elders with installing them. The cables you have to hook up require fine-motor skills when many senior citizens are dealing with issues of stiffness and arthritis in their hands. Many of the inputs have black-on-black writing or very fine print for aging parents that have diminishing eye-sight. Also, the location of televisions and the inputs for DTV cables may require a great deal of strength to physically move the television, or flexibility and balance to crawl underneath or behind sets. For the DTV Transition and Senior Citizens, some of the language may be unfamiliar, for example, the need to "scan for the signals in order to make sure that the new channels are properly programmed." YOU WILL NEED TO RESCAN THE CHANNELS AFTER YOU INSTALL THE CONVERTER BOX. The channel structure might be confusing. For people that are used to hundreds of cable or satellite channels, this is no big deal. For my older relatives that have always had only 3 channels -- the new 26, 26.1, 26.2, 26.3, etc. will be very confusing. “The Digital Television (DTV) transition is the switch from traditional analog TV to digital TV. This transition represents the most significant advancement in television technology since color TV was introduced. DTV will allow broadcasters to deliver movie quality picture and sound. It also provides more programming options for viewers because broadcasters will be able to "multicast" or air up to six different channels over one signal, such as an 'all weather' or 'all traffic' channel." You will have to explain all this more than once. You'll need to be patient with older people who don't learn or adapt as quickly. For those who have the beginning of memory loss issues, the changes may be especially disorienting. The television will look the same, but will function totally differently. Test the TV reception once you have helped to install the new converter box. 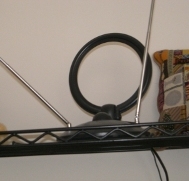 Some older antennas may still need to be replaced if they only pick up analog and not digital signals. You can help the DTV transition and senior citizens in the community. You can organize a group to help seniors in your church or your community. The DTV transition and senior citizens is further complicated when a new tv purchase is involved. If your parents choose to buy a new TV, make sure that you help them get accurate information. The choices can be overwhelming -- DTV, HDTV, LCD, Plasma TV, and too many seniors are getting bad information at the local stores. I promise to use it only to send you "Talk With Aging Parents".